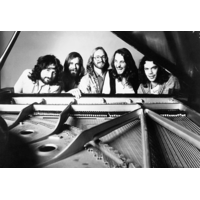 Supertramp are a British band whose music has spanned the genres of rock, progressive rock, and art rock. The band's work is marked by the use of spiritual and philosophical lyrics and the distinctive voice of co-founder Roger Hodgson, who appeared on the majority of the band's biggest hit singles. They were also well known for their prominent use of the Wurlitzer electric piano. While the band garnered little respect from music critics, they enjoyed considerable commercial success, releasing a series of top-selling albums in the 1970s and early 1980s; 1979's Breakfast in America, their most popular album, had sold more than 18 million copies by 1990. Supertramp's early music included ambitious concept albums, from which were drawn a number of international hits including "Dreamer", "Give a Little Bit", "The Logical Song", "Breakfast in America", "Goodbye Stranger", "Take the Long Way Home" and "It's Raining Again". The band attained superstardom in the United States, Canada, most of Europe, South Africa, Australia and Brazil, while enjoying moderate commercial success in their native UK. Since Hodgson's departure in 1983, co-founder Rick Davies has continued to lead the band with some success.